The gardens of Cassiopeia were ripe to overflowing last week as Brooklyn garage-punk princes Parquet Courts swept into town. Nestled in RAW, a complex of abandoned buildings along the Spree, the venue was a real treat. The expansive outdoor area was littered with an array of bronzed summertime bodies as the sun beat down on the cement—some choosing to relax by the countless tables and sip from straws, others strapping themselves into harnesses and scaling the concrete walls, which have become makeshift urban boulders. Hundreds of bicycles lined the alleyway at the entrance, and a familiar cacophony of wheel clacking was just audible through the thick door of the skate hall. Meanwhile, the open-air cinema was settling itself in for an evening of visual delights beneath the glare of a Berlin midsummer sky. To the left, a steady line of patrons were filing up a metal staircase and into the bowels of the building, peppered with baseball caps, striped t-shirts, and American sneakers. Disappearing from the evening air and into the dimly lit folds of the venue, they flocked earnestly to the concert floor to stake out a front-row position. Indeed, the crowd was so earnest that the entire hall was swarming with people long before support Zulu Pearls had begun, pressing at the walls and forming battle lines across the door. The temperature rose steadily as they opened the evening, playing a decent set of, well, rock. It was met with enthusiasm by the audience members, who planted their feet firmly to the ground and held fast, like mussels on a rock. 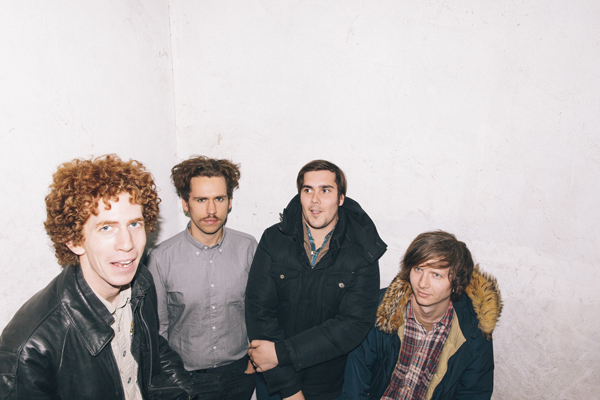 When Parquet Courts took the stage, the atmosphere was worked to a fever. Packed in shoulder-to-shoulder, listless hands reached above the sea of heads to brush at some dry air, the walls quickly progressing from sticky to dripping. The band launched straight into its set with an almost-frenzied energy that existing fans of the band will already be familiar with, from the breathless fireball of an album, “Light Up Gold.” Despite the heat, heads were throwing themselves off-kilter and limbs were flailing as wildly as the limited space would allow. At any one time, there was a straggling group of 10 or so patrons hovering at the entrance, unable to fit inside, craning their necks to mark potential paths through the crowd. Eventually, many of them just stayed there—favoring the slightly fresher air over being able to see the musicians. One man at the back was heard asking those around him whether the drums were being played live or electronically, as he was unable to see for himself. The set was like a comet, constantly blazing, starting with a steady orbit. Parquet Courts played a wonderful mix of tracks, being sure to inject plenty of the new record “Sunbathing Animal” between well-known garage jewels from 2013 masterpiece “Light Up Gold,” such as the two-minute heart-skip “Borrowed Time” and, of course, the title track. It was relentless, frenetic, and vocalist Andrew Savage stared out intently at the audience, his eyes wide and unblinking, brows slightly furrowed as he drawled and hollered. At one point he stopped to talk to the crowd while retuning his guitar and was accosted by an impatient (and probably heatstruck) fan, who demanded that he hurry up and play a song. “Why don’t you play a song, tough guy?” retorted Savage, before launching back into the jam. The sound had a delicious complexity. At times the boys leapt from track to track as though abreast a jackhammer, refusing to breathe. At others, however, they descended into wild and twisting jams that left roots behind like a comet trail, streaking into insistent drums and warped, slightly shrieking guitar bends that lifted the crowd above its limp and sweaty situation into brief moments of ecstasy. The unique nature of the sound is surely due, in large part, to Parquet Courts’ impressively broad spectrum of influence. In a recent in-store video at Amoeba Records, for example, the band had selected vinyls from the shelf that included everything from REM and The Bee Gees, Yoko Ono and Patti Smith, to Lightning Hopkins and The Fall. The concert blew itself out like a torch, leaving the crowd in darkness, the walls dripping sweaty wax and emitting wisps of exhaustion. There was no encore, despite the thunderous insistence of the audience—but it was fitting, somehow, that Parquet Courts should finish as suddenly and impulsively as it came. This entry was posted in Show Review and tagged American, Cassiopeia, Parquet Courts, Show Review. Bookmark the permalink.